I received noticed of the second Mysterious Paradise Event in support of World Animal Protection (WAP) that is taking place in Second Life. Running through until Sunday, November 4th, 2018, the event features shopping opportunities and an entire region to explore, with a day devoted entirely to entertainment to support the fund-raising, on Friday, 26th October, 2018, to raise funds for WAP, although visitors can donate to the cause throughout the duration of the event, via the landing point kiosk. As it’s Glen’s [g12n, the director of the event] real life 30th birthday, instead of having a general party, he wanted to do something meaningful by actually making a difference and helping real-life animals affected by recent earthquakes, major storms, etc. The first event held be the organisers on behalf of WAP in March 2018 raised L$60,000, and they are hoping to exceed that total this time around. The event region is richly decorated in a tropical theme, with both above ground and undersea areas to explore, opportunities for photography or to simply chill out and appreciate the tropical theme of the setting – and of course shop and raise money for WAP. The merchants participating in the event and / or sponsoring it are: Anarchy, Blueberry, Cerridwen’s Cauldron, Evhah, Figure 8, Havana, Grandeur Décor, Love Lace Designs, Love Nature (landscaping by Felix VonKotwitz), Mysterious Designs, Patron (Eliza Weirwright), PopSugar, Sources, Surfer’s Bay, The Boardwalk, T | L | C, and 3D Trees. Each is offering selected items for sale with 100% of proceeds going directly to the fund-raising total, or have donated gift cards that will be handed to those making significant donations through the main event day. In addition, some creators have also items that are included in the random gift giver to be found within the Mysterious Paradise region. 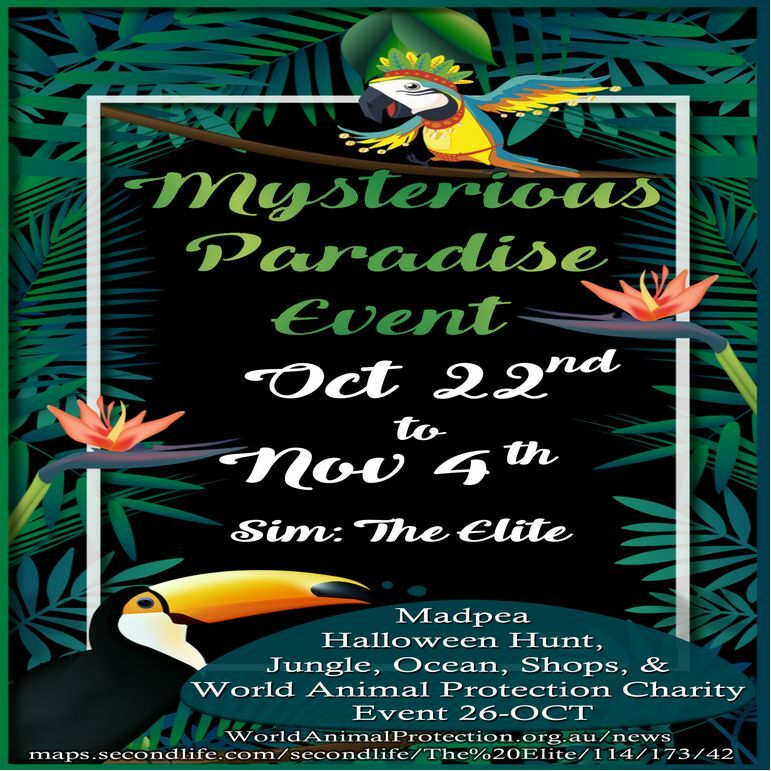 Mysterious Paradise is participating in the MadPea Halloween Hunt, so if you’re taking part in that event, please consider showing your support for WAP while visiting the region. World Animal Protection seeks to improve the welfare of animals around the globe – wild or domesticated – through public awareness, education, animal protection, animal rescue, animal welfare, and more. Based in Australia as a registered charity, WAP operates a number of region hubs across the world, in Africa, Asia-Pacific, Europe, North America and Latin America. From these they are able to mount a range of campaigns to support and protect animals, which include better education in matters of animal welfare and husbandry, vaccination programmes, support for government programmes for more humane means of animal care and the treatment of disease (such encouraging the management of dog populations through anti-rabies vaccination and through neutering programmes, rather than annual dog cullings), and ensuring animals are provided and cared for as a result of, or the event of, a natural or other disaster. Note: the organisers of Mysterious Paradise are not directly involved with WAP or represent it directly in-world. However, the event is entirely non-profit, with 100% of all funds raised to go to WAP, and proof of payment to the charity, etc., will be provided after the event, via the Mysterious Paradise web page.